What defines whether a quality is divine or demoniac? What defines whether a quality is divine or demoniac? 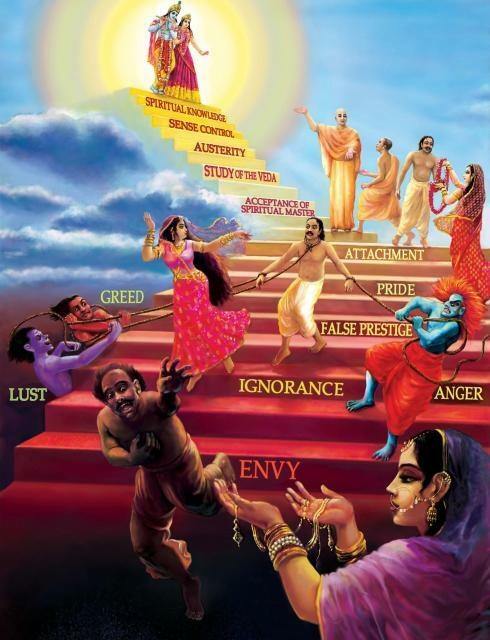 For instance, anger used against the enemies of devotional service purifies one, whereas for sense gratification lust, anger and greed pave the “royal road” to hell. The actual standard to judge whether a quality is divine or demoniac is its connection to the Supreme Lord and His devotional service. On the material platform we make a distinction between divine and demoniac qualities. Divine qualities, for example, charity, non-violence and forgiveness, imply that we are sensitive to others and are acting for others’ benefit. This is purifying and helps us to be elevated. On the other hand, the demoniac qualities, such as pride, lust, arrogance, and harshness usually manifest when we are very self-centered. Blinded by desires to control and enjoy we treat others disrespectfully and thus degrade ourselves. Most world religions praise and encourage the divine qualities and warn against the demoniac. However, a deeper understanding reveals that all qualities generate from Krishna and have a place in His devotional service. From Vedic scriptures we learn how great liberated devotees manifest the so-called demoniac qualities in their pure love for the Lord, for His pleasure. Gopis lust after Krishna and reproach Him in jealous anger; the cowherd boys display arrogance and pride while playing with Krishna. In contrary to mundane demoniac people who are almost purely self-centered, the center of such pure devotees’ emotions and activities is Krishna. Of course, we should not try to artificially imitate such emotional displays before we come to the liberated platform. But even among practicing devotees it is sometimes seen that a harsh and quarrelsome person after a little initial purification starts using those qualities to fight for the cause of devotional service and defend and protect other devotees. Although seemingly demoniac, one has connected one’s nature to the Lord’s service and is getting purified. We should always strive for the divine qualities, since they are the best to be used in the Lord’s service and interactions with other devotees. But at the same time we should keep in mind that it is the connection to the Lord and His pleasure that determines the actual nature of any activity and quality, and not the quality or activity itself.